Wow it’s a new year – 2015. I’m doing something a little different though I always start the year with a post about goals – that’s not changing – but read on to see how I’m changing it up this year. 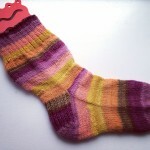 Knit 6 pairs of Mystery KAL socks – fun, right? 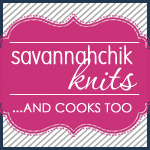 And I get to use up stash yarn – yeah! 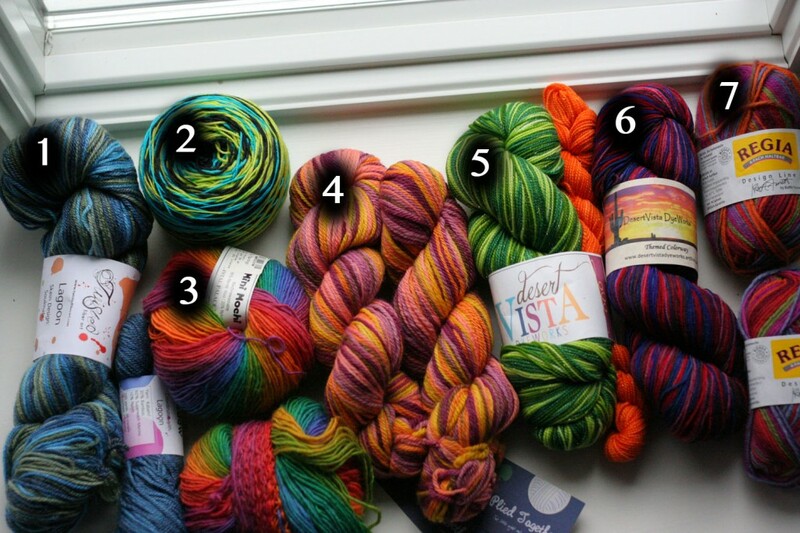 Ok ok I said 6 but there are 7 different yarns – I just couldn’t choose 6. I’ll use a random number generator to pick a yarn after I’m done with the previous one, and I might fit a few sock WIPs in the middle too. 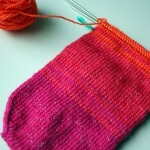 I have 3 or 4 sock WIPs that I’d like to get done too (and bonus since they’re partly there as well). Finish Paul’s Chicago Bears socks – they were his 2013 socks and I never even started his 2014 socks. I’m a bad, bad wife. Finish Paul’s Pismo hat – he loved his last one and he deserves a new one. I guess I’m not too terrible of a wife because the whole hat is k1tbl, p1 ribbing. Oy. Finish Raspberry Tart – I’m less than a full sleeve away. Post twice a week for the next 3 months- I did it for most of December and it was a lot of fun! It also meant I had to plan more so I could actually have pics to post (especially hard in the dead of winter – it’s pitch black by the time I get home from work). 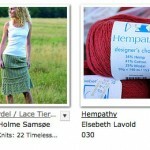 Make 20 comments per week on other blogs – I love getting comments and I need to leave more too. FitBit – I got one for Christmas and I have no idea how many steps I do on a regular day (although I suspect my desk job leads to a whole lotta nothing). I need to move more but right now I don’t even know what “more” is. Eat Well – I started eating Gluten Free last month and I want to continue. I’ve read so much about the benefits of gluten free and I need to give it a good shot (at least 3 months). To be honest though I haven’t noticed any real change in the way I feel which makes it hard to keep at it. Lose 8 pounds – As many of you know, I lost over 70 pounds in the past few years. This year I stayed stable until after Thanksgiving and then all hell broke loose – I ate dessert (often), I ate more than I needed to at many meals and I made poor choices even when I didn’t overeat. 8 pounds may not seem like a lot but it makes a big difference on a 5’2″ frame. Losing the 8 pounds will let me prove to myself that I can maintain this weight loss. Check in each month – assess, acknowledge and adjust. I often do one check in post and then forget. Keep me honest, k? You’ll see I set a timeframe of months for several of the goals. That 21-day habit thing is a pipe dream and I’m really serious here. I’m doing this in my professional life and at home too – if I know I want to make a change then I need to actually make the change. What about you all? What are your goals? How are you going to get there? Have an awesome 2015 and thank you for spending some of your time with me. goals, kal, stashdown chicago bears socks, pullovers, sock yarn, socks, yarn. permalink. Every year I set goals and then forget about them. 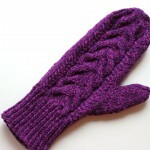 So this year my only real goal for knitting is to use more stash yarn and make more socks. I love your goals though. I am sure that the g-free and weightloss will come easier with time. I love my fit bit! I use it for seeing how much sleep I have gotten or at least to confirm when i think I have tossed and turned all night. I especially love it when all the lights go off and it buzzes at me telling me that I am have done over 10K steps in a day! i’m shooting for an average of at least 8K starting tomorrow. I, too, have been just stupid eating since Thanksgiving and as of tomorrow, it is back on the wagon. I’m afraid that when I go back to work on Monday, my work pants won’t fit! I have had several years of intestinal problems and the docs said IBS. About a year ago, I went gluten free and take a daily probiotic. It took me many months to see a difference and now can say it is well worth it. When I do not stick to it (eating cookies and candy with gluten), I certainly can tell the difference. My advice, if you have had problems, give it some time and stick with it, for me, it has been well worth it! Great goals. Can’t wait to see all the socks. Happy New Year! The Raspberry Tart looks GORGEOUS. 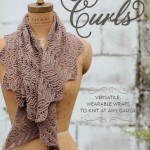 I’m entering new territory with chart-reading and cable knitting, thanks to the book “Curls.” I purchased it based on your earlier post about it, and I’m glad I did. I love all of the patterns in the book! 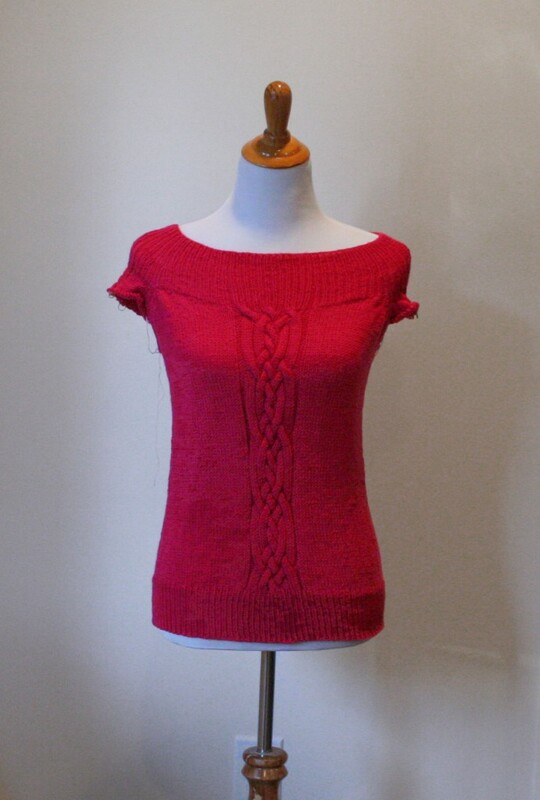 I opened up another Facebook knitting “I’m in!” stash-busting challenge for 2015. Five people said they were “in” in about ten minutes flat! I’m knitting a unique “Curls” pattern for each one of them. Happy New Year! 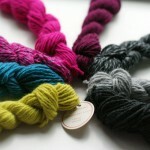 Those yarns are gorgeous!